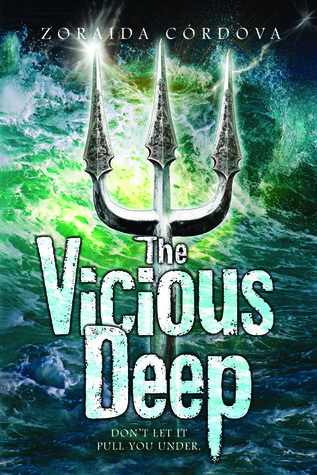 I absolutely cannot wait for May 1, 2012, because that's when (drum roll, please) The Vicious Deep by Zoraida Cordova comes out!!! This book is getting lots of buzz. It hasn't even been released yet, and already it has 40+ ratings on GoodReads. Luckily, I got my hands on a galley! "When an unnatural riptide sweeps lifeguard Tristan Hart out to sea for three days and then dumps him back on the shore of Coney Island, it’s the start of the Sea Court claiming its own. Suddenly, Tristan’s girlfriend dramas and swimming championship seem like distant worries as he discovers the truth: he’s a Merman. Now Tristan must fight for his life, the lives of his friends, and his humanity (if he still wants it), while competing in a race for a throne as ancient as the gods. Seductive, duplicitous, and with an agenda of their own, these are not the mermaids you know." It's been awhile since I've fallen in love with a YA protagonist (perhaps Will and Jem from CLOCKWORK PRINCE were my last affairs), so it was definitely a welcome surprise to meet Tristan Hart, the swoonworthy, smart-mouthed merman of THE VICIOUS DEEP. Written in a frank, witty voice, this paranormal YA had me smirking and cackling on the subway. And even now, I can still hear Tristan's voice in my head. Why are you fictional? Why can't I date you in real life?! Anyway, THE VICIOUS DEEP is a rare find that I kind of was tempted to keep it to myself, but ok ok, I will share Tristan, my favorite mer-dude, with the rest of my blogger friends. Here. Enjoy. Um, that one's going in my iPhone calender as a to be read! Definitely different than the other mermaid books out. As a child, I spent a good solid summer being the ACTUAL little mermaid. Unfortunately, no one appreciated my singing voice as much as I did and thus I had to find another career/personality/identity.